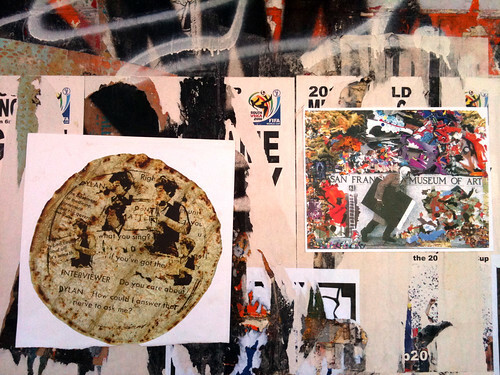 I’m back with another report from the front lines of the Mission District. I’ve been keeping my ear to the streets and my camera pointed at the scene. Gather ‘round while I put it down for the hood once more! 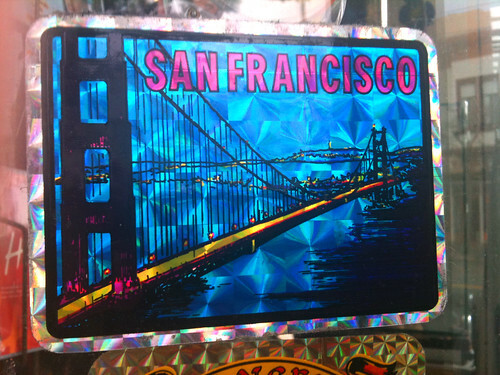 As many times as I’ve walked pass this sticker machine on Mission street between 22nd and 23rd I’ve never taken time to appreciate the amazing art of the “Glory Stickers.” Who knows where the art can be traced to, Mexico? China? The United States? East LA? It’s the most stylish that I’ve ever seen. 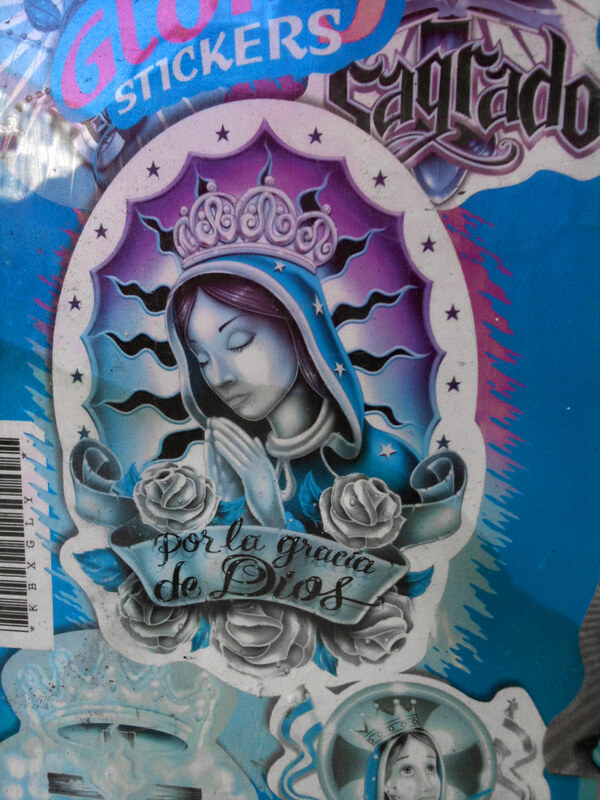 Kinda like a Lisa Frank/Trapper Keeper version of most religious sticker art. The art of these stickers are amazing. Guadalupe looks like a total tenderoni. Check out those doe eyes and her fly Jughead crown. Poor Jesus ain’t fairing as well. He looks like he’s passing something really uncomfortable on the can. Somebody get him some pepto! I love the windows at Julio’s on 25th and Mission. Most of the stickers are from the 1980’s and have held up pretty well over time. 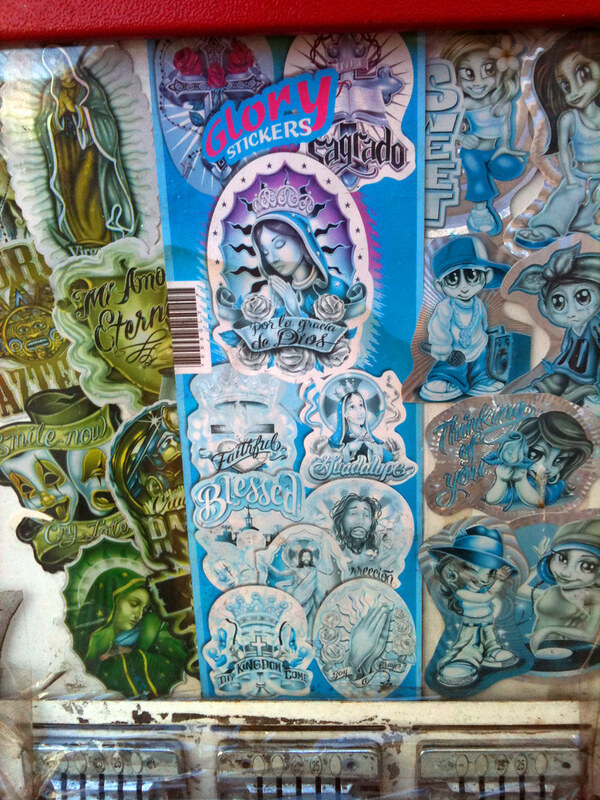 Where else are you going to see the Virgin of Guadalupe and John Lennon given equal presence? Here’s a couple of favorites. 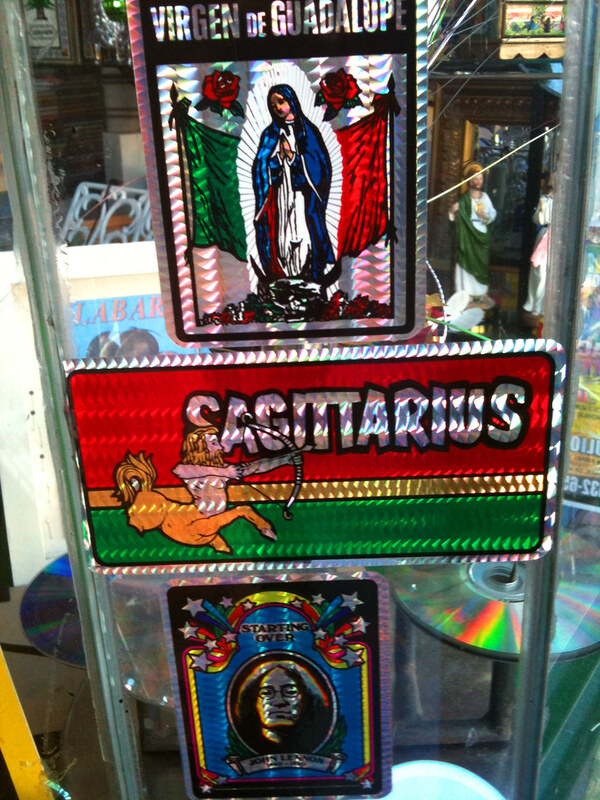 The window displays at Julio’s are ever changing and always densely packed with old school Mission flava. 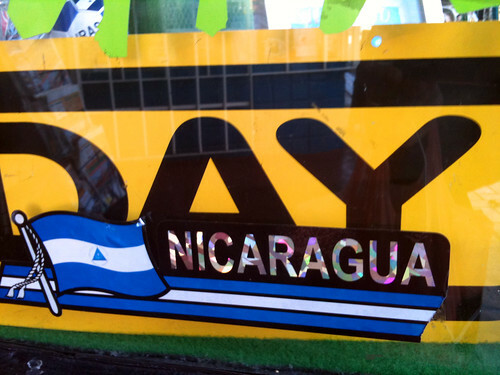 Julio and his store have been around since I was a kid and has always been the most reliable place for me to buy Mexican comics, Loteria cards, and various tourist objects. At this point Julio’s is also one of the last remaining music stores on Mission Street. If he ever goes under who will sell Jenni Rivera records and hand out Ricky Martin posters in the hood? Tortilla Art on the Loose! Spotted on Valencia Street. It looks like a member of the Great Tortilla Conspiracy has been out and about in the Mission. Hopefully more of these will be popping up around the hood soon. 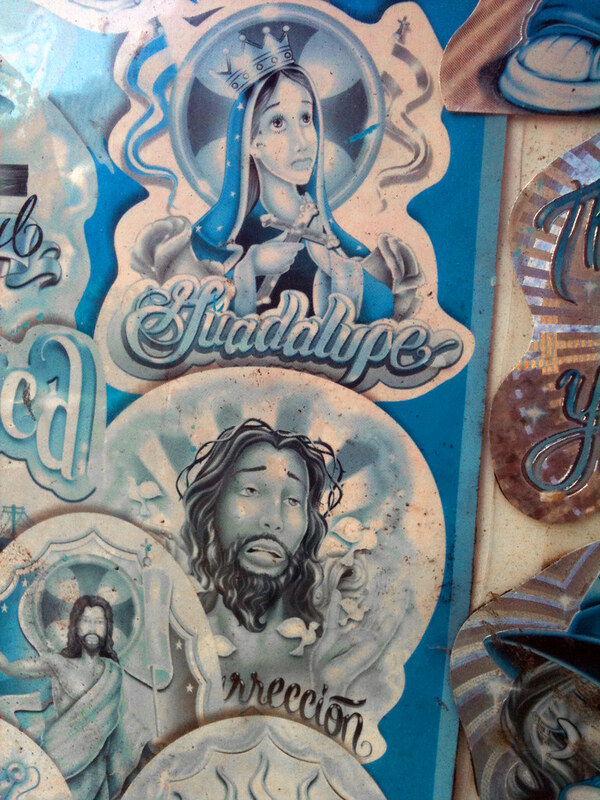 Take your pick for the most airbrushed homegirl in the Mission! Whenever I walk down 22nd street I always make sure to check out the latest and greatest ads for realglamourstudio.com. Only true Mission homegirls can appreciate airbrushing this thick. 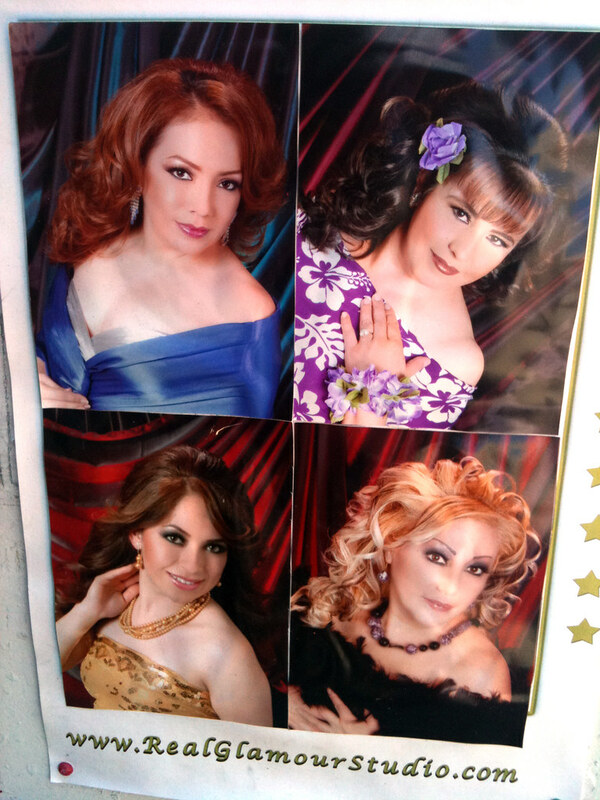 Check them out, all of their photo-portraits have an airbrush gloss that never escaped 1987! That makes realglamourstudio.com not just someone’s portrait studio but a time machine as well. That’s it for now! Until next time, be excellent to each other.